For a complexity and brightness, we squeeze (or grate) 1 fresh/frozen garlic clove in when mashing. Roasting Fresh Garlic: Preheat oven to 325F. Slice off tops of garlic heads. Gently remove lose papery outer skin from sides of heads. Place in oven proof dish just large enough to hold bulbs (or wrap in foil). Drizzle with oil and water. Cover tightly and bake 1 hour. Cool garlic. Squeeze flesh from cloves and mash the garlic with a fork. Roasting Garlic with Ontario Frozen Cloves: Preheat oven to 325F. Rinse frozen Ontario garlic cloves, pat dry on towel or between paper towels. Toss garlic with oil until coated thoroughly. Place on a piece of foil large enough to pouch around garlic (like a sack). Place foil pouch on a cookie sheet and bake about 30 minutes or until tender. May open foil pouch to allow extra browning and caramelization of buds. Remove from oven and cool to handle. Mash the garlic with a fork. 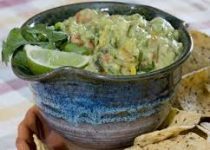 Scoop the avocado flesh into a medium bowl. Add the roasted garlic, diced tomato, cilantro, jalapeno, lime juice and salt. Coarsely mash everything together, being careful to leave some chunks. Taste and add more salt and lime juice if desired (you can also add some of the jalapeno core if you want more heat; just add it slowly). 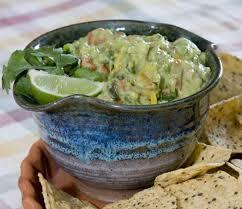 Transfer to a serving bowl and place plastic wrap directly on the surface of the guacamole. Refrigerate until ready to serve.